Gay Asian male who wrote about the gay baths in Bathhouse Blues is back! 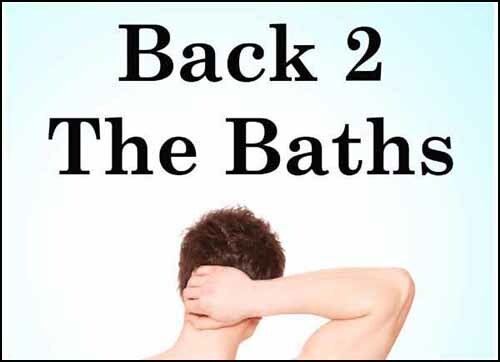 This time with a sequel; Back 2 The Baths. This second edition continues to explore the gay culture of the tubs. Being practically naked, there is a certain inhibition and vulnerability. Stripped down, people’s walls and guards are down. It puts men interacting with one another on an equal level playing field. You have corporate lawyers interacting with truck drivers. You don’t know what the other person does, since everyone is only in a towel. There is a certain equality being at the baths. Much more so than in a bar setting. As people are truly judged by what they look like or what they wear. Being naked brings a sense of equality, with some men being better looking than others (obviously). What the baths offers these men is a false sense of security and acceptance. Because the baths are such a closed doors environment, many men feel safer connecting with other gay men at the baths than the bars or clubs. There is a sense of freedom to let go and feel uninhibited. Gay baths is the only gay meeting place where you can see a cross section of every queer group imaginable under the same roof. It is truly a microcosm of the entire gay community all in the same place. Little has been written about bathhouse culture, until now. This book will shatters myths and open some eyes. You will learn even more about an activity that many gay men have enjoyed for decades. If you enjoyed Bathhouse Blues, you will love this book. Help support this site and Bathhouse Blues. Order your copy at Amazon for only $2.99 Just Click This Link NOW!.